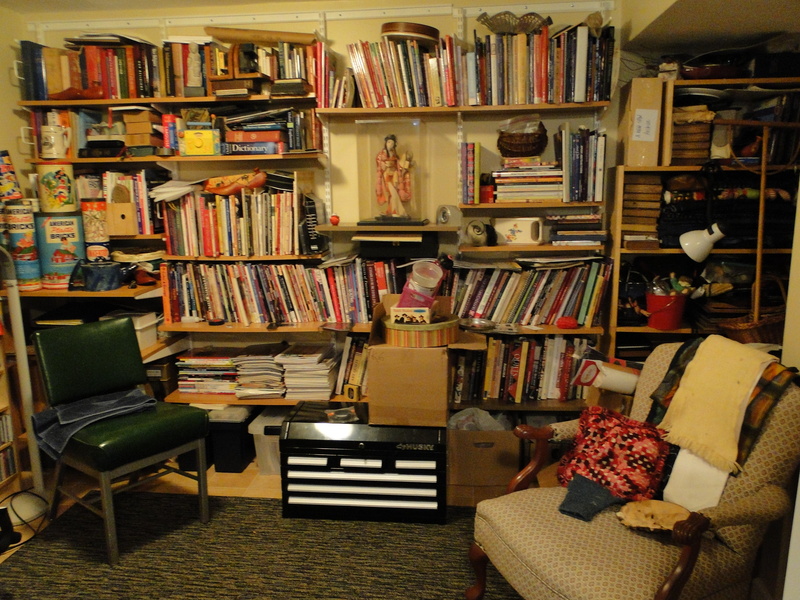 Oh where do I begin, well I believe I need to say that this starts with the tale of TWO LONGARMS in one studio. 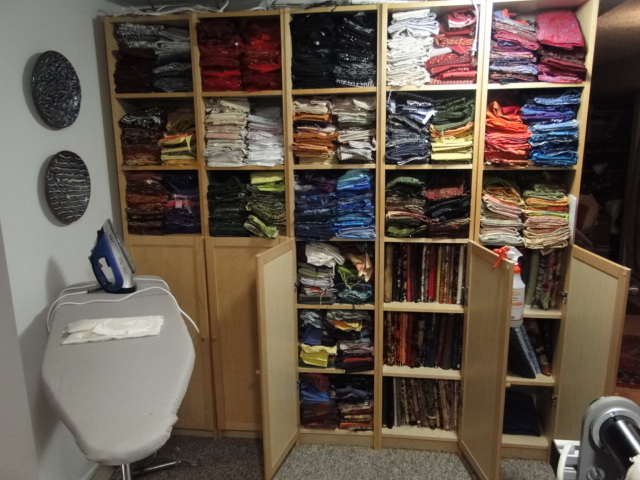 This past year I upgraded to a BERNINA Q24 Longarm, but had not yet sold my previous machine – so I moved it to the other side of my studio basement, where it blocked my design wall. 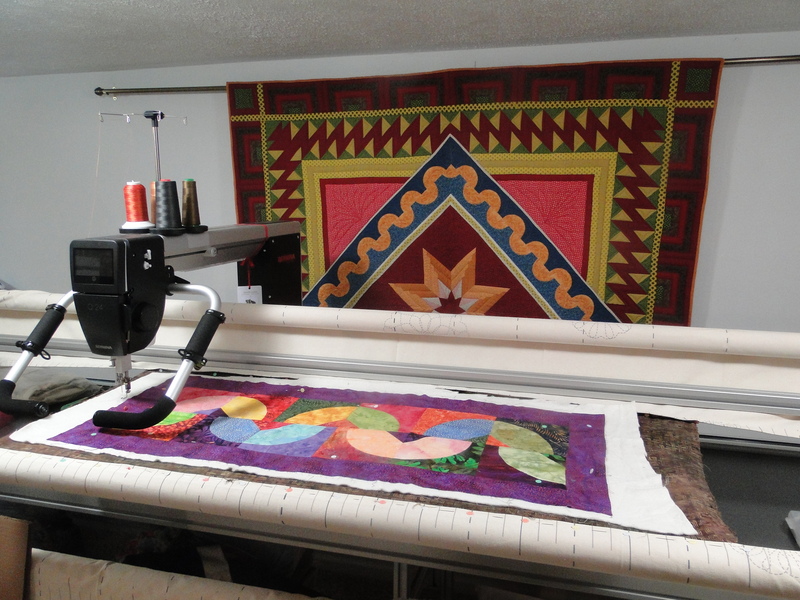 I recently sold the longarm and that meant, well moving stuff. 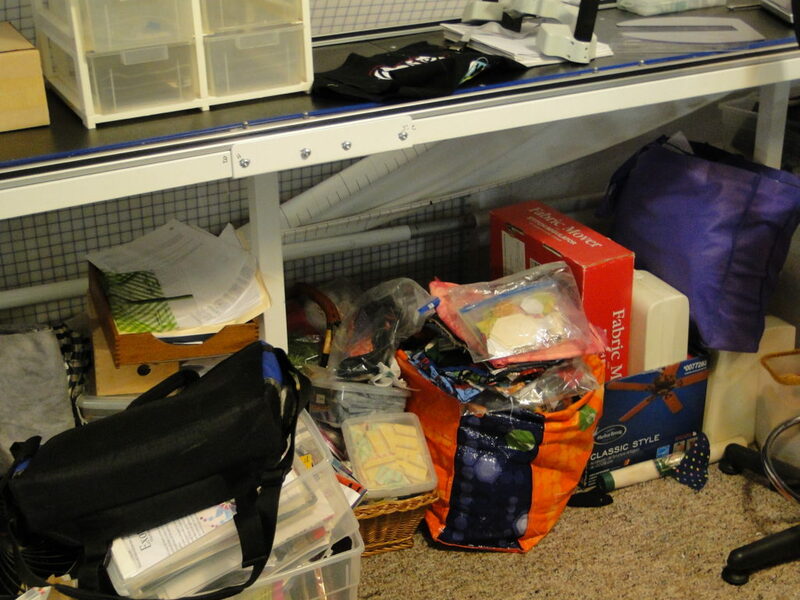 You never ever really realize how much STUFF you can cram under a longarm and onto of an unused longarm until you have to move it. 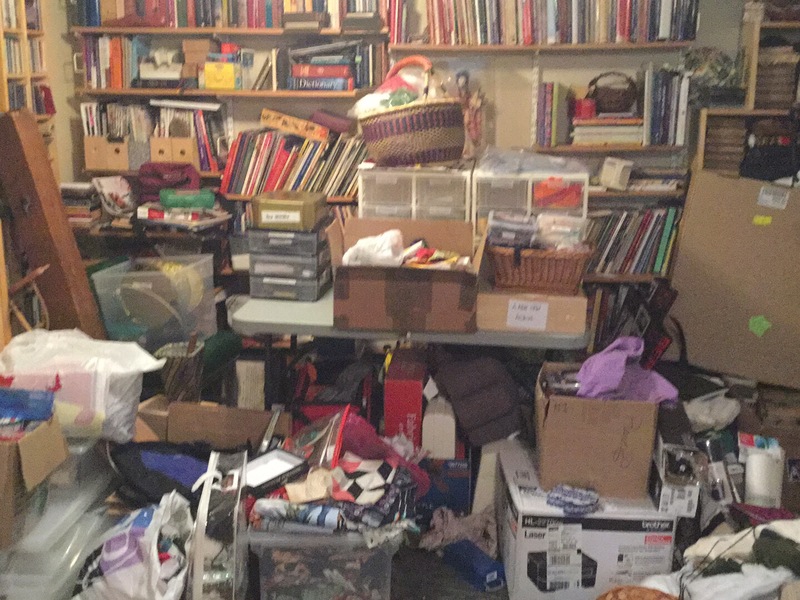 YEP – you guessed it – ONE BIG MESS. 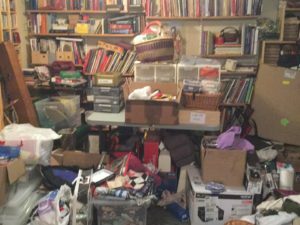 But I saw it as an opportunity – take all that stuff out and gradually bring it back into the studio (if I deemed it usable) and if not – out it went. So, I just took a few weeks (yes a few weeks) to basically “do the deed”. 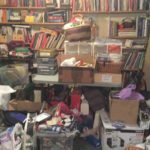 OK, I confess those few weeks turned into a few months – and Cheryl’s invitation spurred me onto finishing up “most” of the clean-up. I had lots of other fabric that had been hidden away in bags and boxes and it finally was released from confinement. 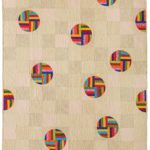 The fabric rejoiced at having a chance to come out into the open – and I too rejoiced, because I could see it. The motto “out of sight – out of mind” is so true. 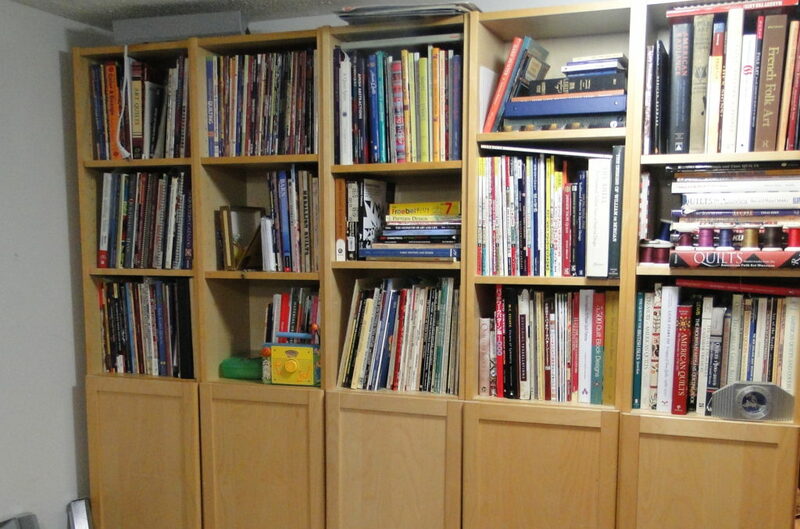 And the books – they have found their way into the “library” – which is still “under construction” – but hey doesn’t it look a lot better than one of the first shots of it in this post???? (Please say yes). 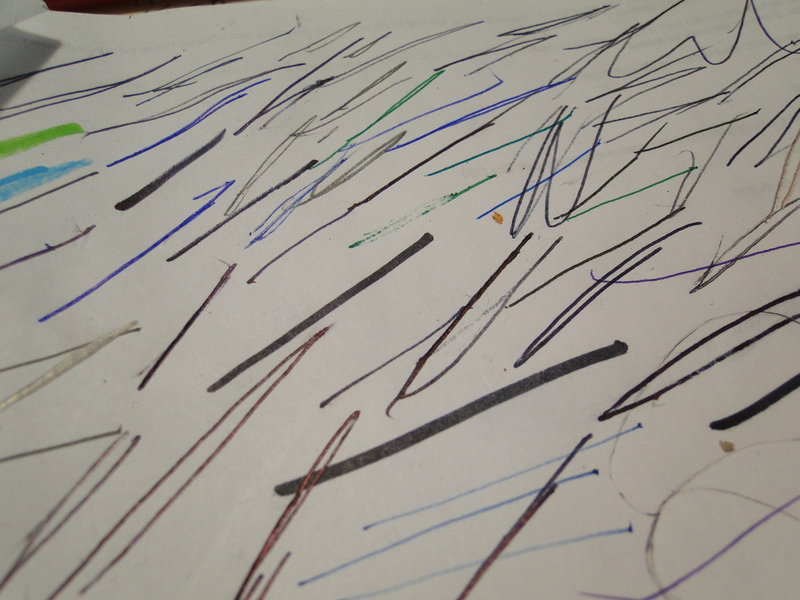 And I have tons of pens and pencils that were a big mess – so they all got dumped and I tried them all. 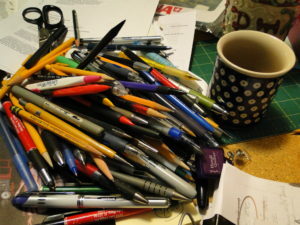 If they didn’t work – in the trash, if they worked they got put in containers, pens in one, pencils in another, mechanical pencils in another. I am not usually like this – but I do like this new system. 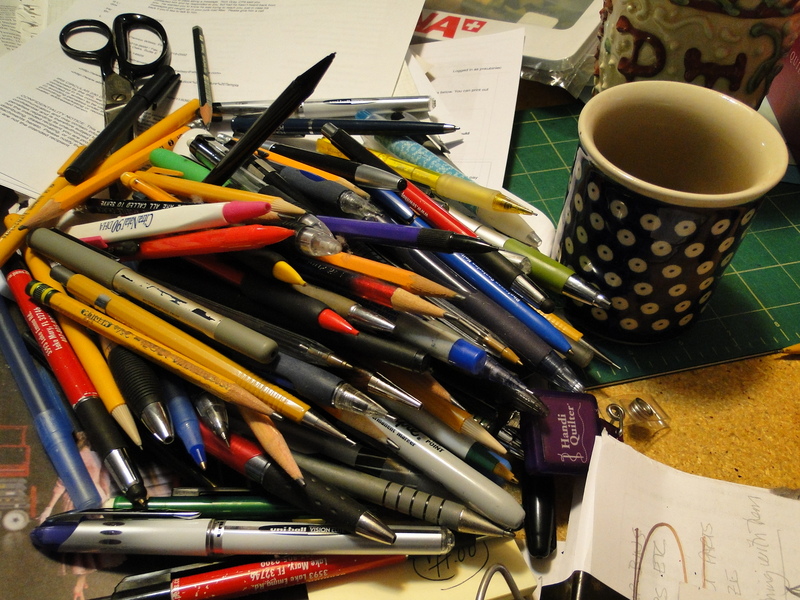 I can just reach for the type of writing implement I need. And I do try to put them back after I use them. 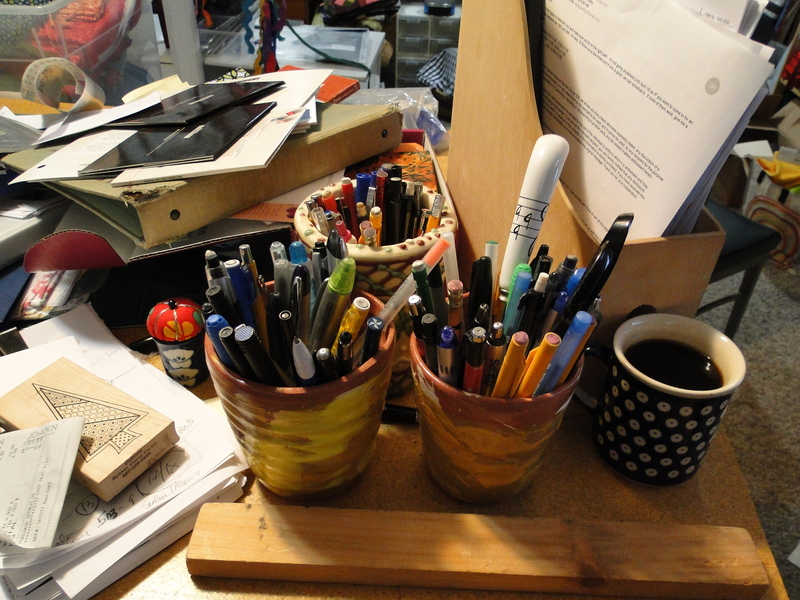 Full disclosure – I am not always good at that, so every few days I grab up all the strays from around the studio and put them away (I usually do this when I am avoiding some other awful task!). 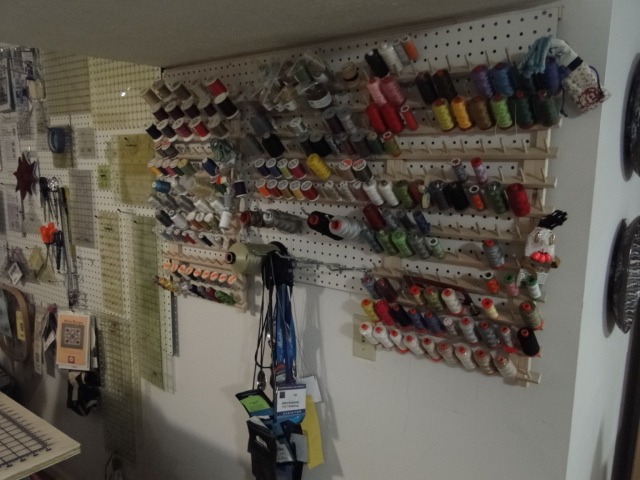 My template-ruler wall got re-organzied as well as my thread wall. 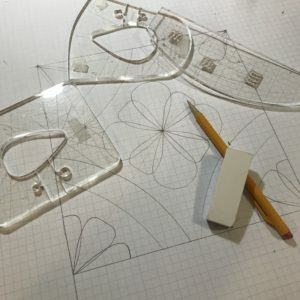 Those are most of the rulers and templates I have, but rest assured – I have more thread in other places! 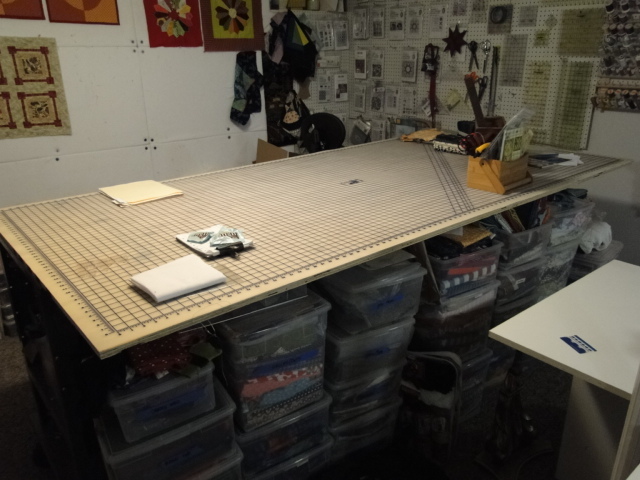 Now my worktable – well it measured 3 feet x 8 feet, but I wanted something BIGGER (well I am BIG RIG QUILTING!). 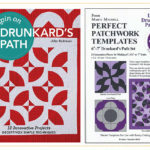 I wanted something bigger to be able to lay out borders and quilt tops to be able to pin and trim with ease. (and just hold MORE STUFF) I had the purchased the large cutting matt but needed to enlarge the top – so I got a 4 foot x 8 foot piece of plywood and put it on the base and put the matt on top of it. 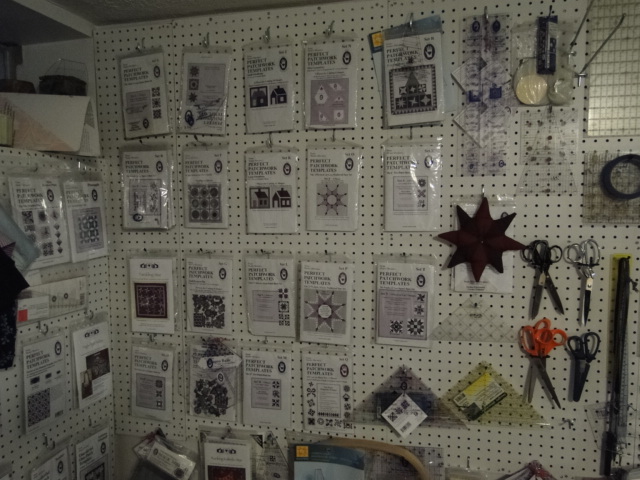 I now have a great space for pinning and cutting and an even larger horizontal surface to gather “stuff”. 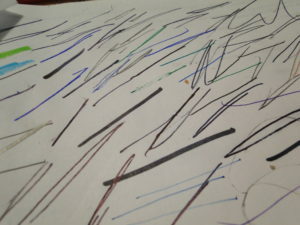 I intend on padding the plywood and covering it with canvas so that it can also double as a super-large pressing surface. 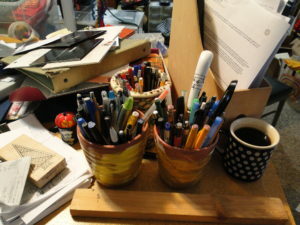 And my desk – well, I had been using a door that was 18” x 8 feet – it was just too narrow – so I too the top of my old work table and made it my new desk top. 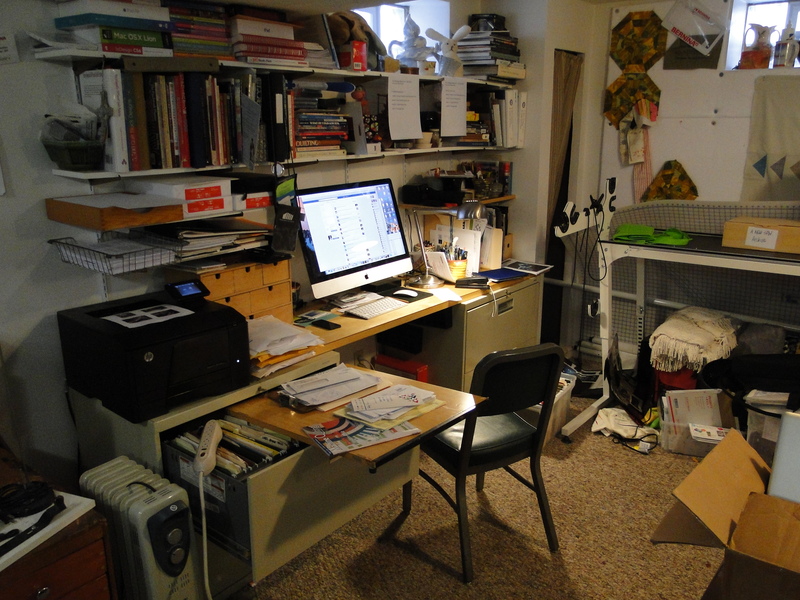 I now have a larger working area (and also a larger area to collect “STUFF”). 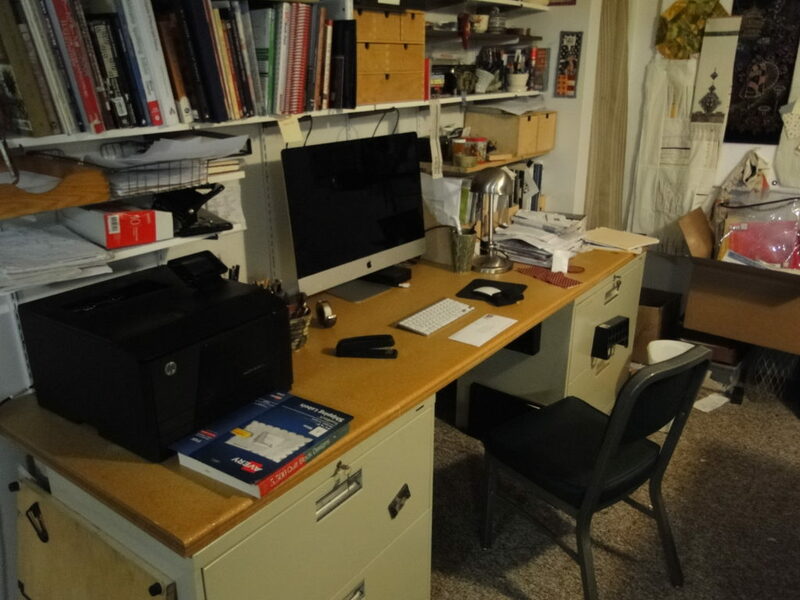 As you can see – before I had to put a board onto of my file drawer to give me a place to hold papers and files I was working on – now I have lots of room to work. 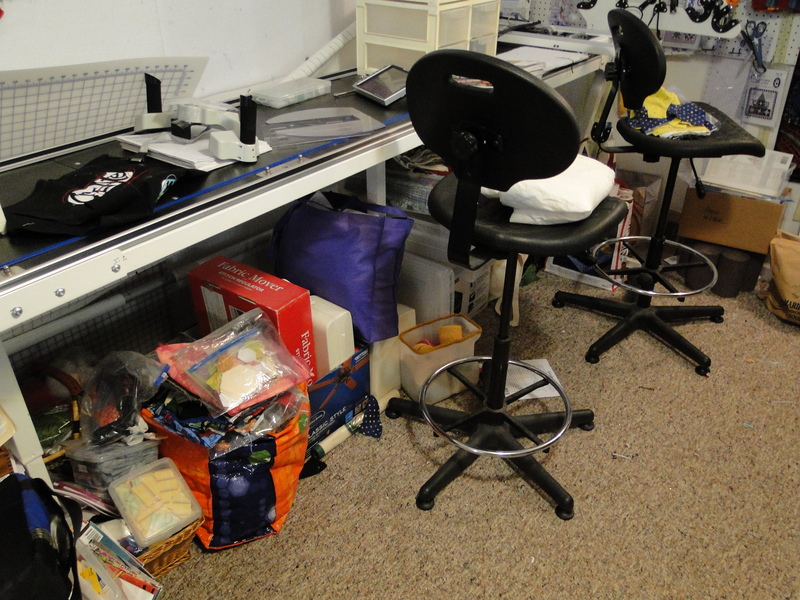 And here my BERNINA Q24 longarm happily situated. I like it so far, I will most likely tweak things along the way. My advice, just dive off the cliff and DO IT. 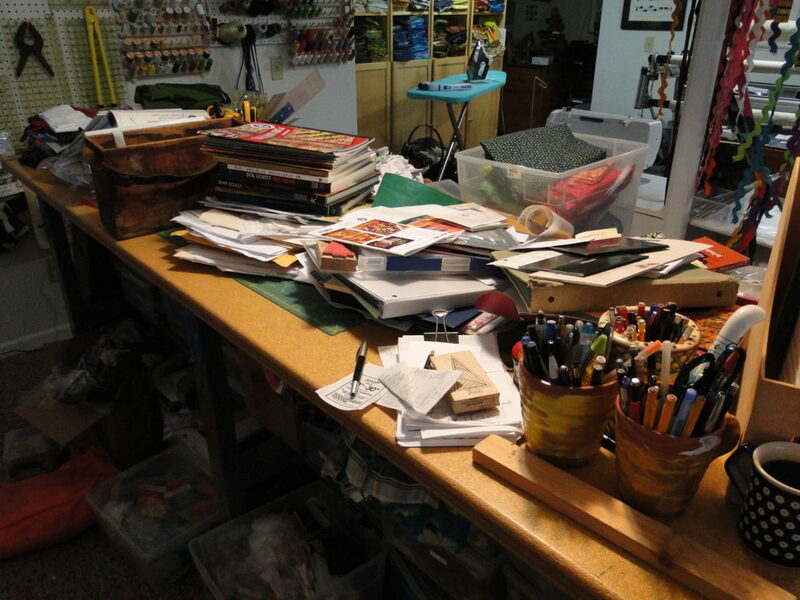 Carve out some time and clean things out, clean things up and get on with creating! 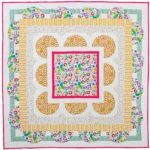 And don’t forget to check out all the other great SPRING CLEAN YOUR STUDIO BLOG HOP! These bloggers have already shared! More great stuff to come! Wow-you make me feel so much better about my studio! See you on the 11th!